If you read my blog fairly regularly you know I have a special person I visit every week. He is dying. Of course we are all dying, but he is closer to the subject than most of us. I cherish our time, and the hours I leave the world behind and am at the farm home he and his wife have built – a magical island of calm. It had been a month. I had the flu and the weather kept me away for the other three weeks. It had been too long. I missed the smells of cooking and herbs drying from threads across the corners of rooms. I missed the birds gathering for a chance at the feeder. I missed his smile and our gentle routine. His room, as warm as a tropical isle, looks out on the barn. The chocolate brown cows have grown and the goats looked fat and happy. I stood in the window and looked very closely with my inner Allen from NHGardenSolutions training my eye. Yes! the Lilacs are budded and seem to be actually swelling just a touch! Or am I so desperately hopeful? But I pointed it out to him and he agreed, they looked alive. We discussed taking a walk, then his wife came in and wondered if a ride in the car might be on the schedule. The temperatures are bitter and the effort was scrapped. We would keep to the small, warm world of his home. We wandered out to the kitchen to watch the birds. He preferred to stand at the window, when I offered to bring the wheelchair. It is healthier for him to walk and stand. We dug out the bird book and looked up my guess of Pine Siskins then tried to discern the individuals as they came and went. 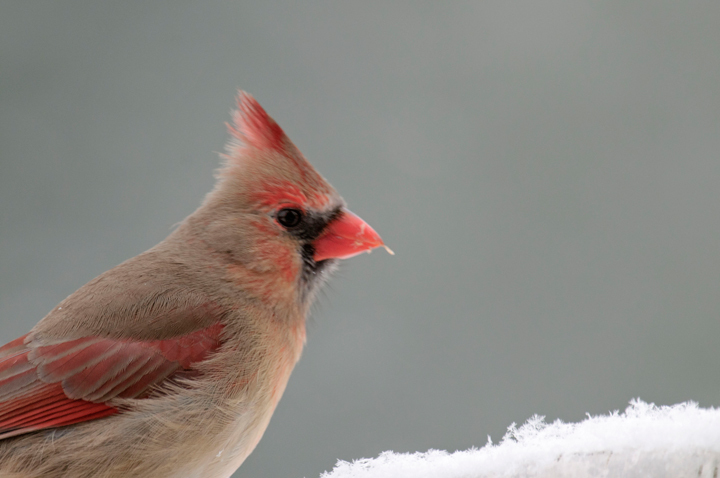 A female cardinal, dressed in her respectable dove-gray suit, perched on the railing and cocked her head at us inquisitively. He was in a lot of pain. I could see the twitches when it caught him in its grasp. His wife gently administered remedies and soothed him. A hot water bottle provided relief. He fought hard to stay awake and bright through our lunch. I brought stuffed eggplant knowing it wasn’t enough but hoping it would be enough of an addition. He repeated his anticipation of the delight all morning. In the end, I knew he was exhausted but he ate with such relish it didn’t matter. This entry was posted in Uncategorized. Tagged death, dying, finding joy, hospice, Palliative care. Previous Post Previous post: Childish Behavior? Thanks Julie. I am a lucky girl to have them in my life! Thanks for the blog mention Martha. Those lilac buds might have been swelling if they get a lot of sun but normally it would be a little early. If seeing them made you and your friend happy it really doesn’t matter. Thank you Marie. I saw him again today and he was so thrilled to see the sun and the melting snow. Even if he doesn’t see Spring, he sees beauty every time we are together; that’s my lesson to learn. My mother – in – law didn’t quite get to see the Spring this year. But once again she provided us with so much, New York when not stifling, all the family together and the future visit back to Guyana to lay the ashes by her husband. It was an honour to share her last journey. Cheryl, I had no idea. I’m glad you see it as an honor, truly it is and will be to go the last leg to Guyana. Bless you!